So what will the Honor 20 and 20 Pro have? We've heard rumors that the Honor 20 will be available as early as the end of April, and it looks like it won't be alone, if a report that's claimed to provide in-depth information on the Honor 20 Lite is anything to go by. The report, by WinFuture, appears to be a huge information dump about the smaller sibling to the Honor 20, including its display size and camera setup. According to WinFuture, the phone will have a three-camera rear setup consisting of 24MP main, 8MP ultra-wide and 2MP depth-sensing cameras, which will be joined by a 32MP front-facing camera. 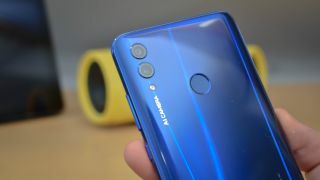 These specs sound similar to the Huawei P30 with its 40MP main, 16MP ultra-wide and 8MP telephoto rear cameras and 32MP front snapper, which makes sense since phones from both Honor and its parent company Huawei use the same Leica camera tech. Could the iPhone 11 have three rear cameras? What will we see in the OnePlus 7? One strange feature of the phone, if the report is accurate, is the fact that it's got a microUSB port for charging its 3,400mAh battery and connecting to devices – that's rather old-school in 2019, and would make the handset feel a little dated. Lastly WinFuture claims the phone will have a Kirin 710 chipset, which we also expect to see in the Huawei P30 Lite, and run with 4GB RAM, which is a fairly standard amount, but its 128GB internal memory should be plenty for most users. While we can't say for sure if the report is accurate, it does back up what we'd expect to see in the device, as Honor phones usually re-use features seen on Huawei flagships. For now Honor can't tell us when the Honor 20, as well as the Honor 20 Pro and Honor 20 Lite, will release, but we don't expect it's too far off, so stay tuned to TechRadar for all the latest phones news.